Jim Baumgardner is the author of the award winning book: Sarah's Wish. The four Sarah books can be viewed at www.sarahbooks.net. The author has also published three Bible novels, the latest is Esther Queen of Persia. Visit Jim at www.biblenovels.net for more information. Esther, Queen of Persia by Jim Baumgardner is an outstanding, biblically accurate and historically consistent presentation of the Book of Esther. Combining an intimate familiarity with the Book of Esther, with an intensive study of the historical customs and events of the Persian Empire, Baumgardner has penned a moving and very believable historical fiction novel. True to the biblical account, this book offers a rare glimpse into the past, when Persia ruled the known world, from India to Libya. At times one wonders if, perhaps, Baumgardner hadn’t located an unknown scroll from that era and merely copied a true story … it’s that believable. Esther was a mere teenager when King Ahasuerus commanded that a large number of young virgins be brought to the palace, and prepared for a year to become presentable for the King’s bedroom. Ahasuerus needed a queen to replace Queen Vashti, whom he had banished from the kingdom in a drunken rage some years earlier. If you know the story of the Book of Esther, you know it was she who ultimately was selected for that lofty position. Esther, Queen of Persia is a fascinating tale. The minute details Baumgardner included brought this story to life. Even knowing the biblical account, I still found myself in suspense, wondering what would happen next. If this story were entirely fabricated, with no biblical or historical documentation from which to build it, it would still be remarkably entertaining. The fact that it IS built upon a true story just makes it that much more beguiling. 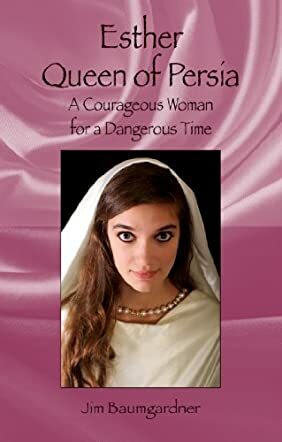 This story is not strictly for Jews and Christians; anyone who enjoys historical fiction will find Esther, Queen of Persia to be a captivating and charming love story. I urge all readers to consider enjoying this book. I sincerely hope Jim Baumgardner plans to write more such stories; he has a very obvious talent for weaving history and timely imagination into a great tale.